Hello on this fine, last day of February! I know February is the shortest month of the year so it should feel like it ends sooner than others overall, but it feels like it has gone so much faster than usual. Even though my illness felt like it lasted FOREVER at the time (I definitely lost over a week this month with being stuck in bed until my fever broke), this month has just flown by! 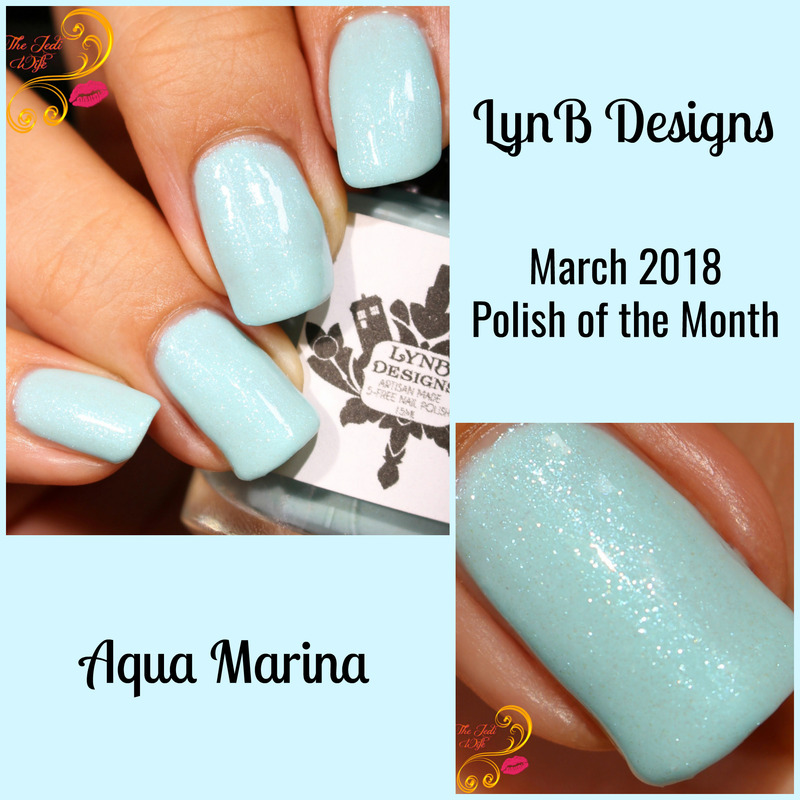 Obviously, with the end of one month means the start of the next; in the case of today's blog post, it means a new Polish of the Month from LynB Designs! Jenna has decided to follow a birthstone theme for each month, and that means an aquamarine-inpired beauty for the upcoming month of March. Presenting: Aqua Marina! Aqua Marina starts off with a light aqua base that is filled with shifty shimmer and micro holographic sparkle. There is also a small scatter of white flakes to add a little extra dimension to the polish. As a March baby myself, I cannot tell you how many times I've looked at aquamarine jewelry only to be faced with stones so pale, they didn't deserve the name aquamarine. Thankfully, Aqua Marina captures the true light blue shade that I expect from these stones, and I love the sparkle! While this polish is truly beautiful and worth adding to any collection, you will need a little bit of patience with the application. Light blue shades like this are notorious for trickier application, and you will want to take your time and build up layers to reach opacity. Applying it with a heavy hand makes the formula move around awkwardly and forms unflattering grooves, but you will want to take care not to use coats that are too thin either. While the white flakes add a lovely touch, applying layers too lightly can make them dig into the base that is already in place and leave an uneven surface as well. In my application, the first two coats were a bit uneven in spite of my best efforts, and the third coat helped even things out some. It was the final addition of top coat that finished smoothing my nails out for these photos. Even though it took a little extra patience, I love the final look of this polish. The sparkle is stunning and I really do feel like I have aquamarines on my nails! I am admittedly really particular about gemstone themed polishes, and this is arguably my favorite for aquamarine from all the ones I have tried. This is also such a pretty shade for spring in general, so if you're eager to get rid of the winter (dark) blues, Aqua Marina may be just what you are searching for! Aqua Marina will be launching on the LynB Designs website located here this Friday, March 2nd. Each bottle will retail for $10. Have you been picking up the LynB Designs Polish of the Month gemstone series this year? Will Aqua Marina be making its way into your collection? I'd love to hear from you! Wow I love this!!! I love the shimmer. I may need to treat myself to this one as I haven’t gone into labor yet so I’m definitely having a March babe! That is a gorgeous shade! Worth any tricky application! Love this shade, especially the pretty sparkle! it is very pretty. Almost bridal. I wonder how it would work as a topper? omgggg what a gorgeous color! So me! I love how it looks like a creme and then that sparkle shows up! What a sweet, pale blue! Such a good shade for this time of year. That's a really pretty soft blue. This is soo pretty and delicate! I love the shimmers! This is so dreamy. Love it. I know some pastel shimmers can kind of have a "chalky" sort of formula. But they can still be gorgeous and I wear them anyway! Such a pretty shade of blue, perfect for the Spring! Wow! This is so pretty and perfect for Spring!!! Need! !